HA note: The following is reprinted with permission from Libby Anne’s blog Love Joy Feminism. It was originally published on Patheos on January 19, 2014. 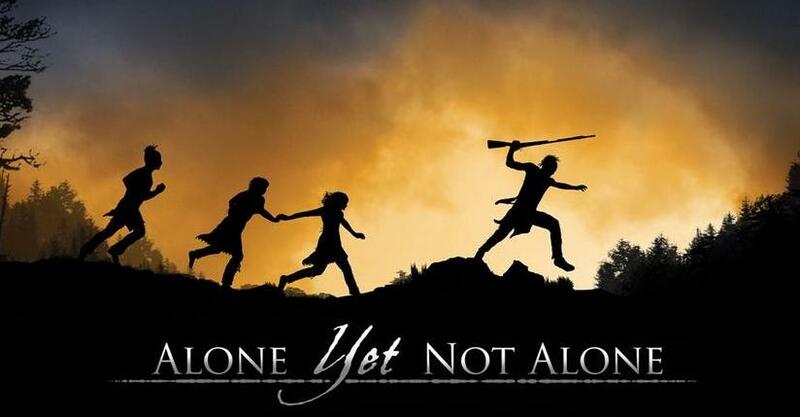 Alone Yet Not Alone, based on a book about two children who were kidnapped by Native Americans during the French and Indian War, was released as a movie in 2013 by Enthuse Entertainment. It showed in select theaters for only one week. This month, to everyone’s surprise, it was nominated for an Oscar. I’m not interested in talking about how it got nominated, which seems to be the focus of most articles on its surprise nomination. I’m more interested in something else, and that is the connections between this film and some major players in the dominionist/reconstrucitonist segment of the Christian homeschool movement, most notably Doug Phillips and Michael Farris. My first tipoff to these connections was when I learned that Doug Phillips’ daughter Jubliee Phillips is in the film. She plays a Native American girl. Her older brother Joshua Phillips plays a “tall white brave,” according to the cast listing. Doug Phillips is the disgraced founder of Vision Forum, an influential but now defunct Christian homeschool organization. Phillips himself was originally slated to be in the film, though he is no longer listed. It seems the list of those involved also reads like a who’s who of Patrick Henry College graduates. (Patrick Henry College was founded by Home School Legal Defense Association founder Michael Farris in an effort to train up a new generation of Christian leaders to “retake America for Christ”). Alone Yet Not Alone was written by Tracy Leininger, a graduate of Patrick Henry College. Patrick Henry College alum and The Rebelution founder Brett Harris (brother of I Kissed Dating Goodbye author Joshua Harris and son of prominent Christian homeschool leader Gregg Harris) plays a leading role in the film. Several other Patrick Henry College graduates—including Ben Adams and Peter Forbes—were also involved. Not surprisingly, Michael Farris and HSLDA promoted the film heavily. Advent Film Group, founded on the campus of Patrick Henry College in 2007, was heavily involved in producing Alone Yet Not Alone from the very beginning. The group’s co-founders, George Escobar and Michael Snyder, acted as the film’s co-producers, and Escobar acted as co-writer and co-director. Michael Farris endorsed Advent Film Group and has at times contributed to its screenplays. There are more Vision Forum connections too. Tracy Leininger is the daughter of James Leininger, the money behind Vision Forum. Enthuse Entertainment, the film company that turned the book into a movie, is listed as the same address as all of Leininger’s other San Antonio enterprises, including Vision Forum Inc. Alone Yet Not Alone was slated to be unveiled at the 2012 San Antonio Film Festival, run by Vision Forum, but it appears that the film wasn’t ready in time. The film was instead screened at the 2013 San Antonio Film Festival. Not surprisingly, Vision Forum both sold the book and promoted the film heavily. Alone Yet Not Alone appears to be the creation of a collaboration between Doug Phillip affiliates and Michael Farris affiliates. Given that Doug Phillips once worked for Michael Farris as a lawyer at HSLDA, this shouldn’t be surprising. I’m curious how many Patrick Henry College graduates have gone on to work for Doug Phillips affiliated organizations. I have not seen the movie and I have not read the book, so while I’ve heard concerns about racist portrayals and bad acting, I don’t feel I can confidently speak to the content of either. I will say I’ve found pulling these connections together fascinating. This film, with its surprise Oscar nod, is a product of the culture I grew up in. I’ll finish with the trailer, so you can take a look for yourself. There is extensive, scholarly material concerning the treatment of white captives by Native Americans. Many are based upon historical writings of the survivors themselves and their accounts are brutal. I find this article quite informative but I will view the film with an open mind and will not choose to dismiss the film as propaganda and/or racist. Bungalowdweller–my main issue is the portrayal of native americans innaccurately in whitewashing..i.e Doug Phillips daughter plays a native american girl? WHAT and ..Innacurate cultural sweeping.. i.e all tribes wear headbands/headresses. etc.